The planners who laid out the town of Goderich in the early 19th century made a brilliant decision. Before any houses were built and could thus confuse its development they laid out a large square, with 8 roads radiating out from it. 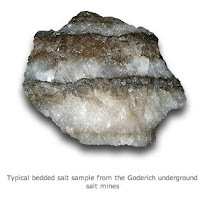 Now, no matter where you are, in and about the town, you can easily find the center of Goderich by following practically any road back to its very heart. The discovery of salt at about that same time ensured that there would be a lasting economic engine for the community. They used to get it out in numerous ways but not until 1950 did they start to mine it. Even now they are hiring more people and digging out more salt from underneath the lake. Big ships come in to the little harbor to load not only salt but wheat as well. At this time of year not a lot is going on in the square. On a very cold morning between Christmas and New Year I seemed to be the only one wandering about. Right now there are lots of Christmas decorations and lights on all sides of the Square. Some look as though they have seen a lot of holidays and of course this year they have already experienced a whole lot more of winter than most years at this same time. 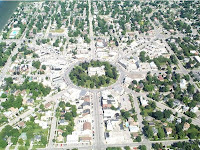 The Huron county court house has always been in the middle of the square. The original one burned down and they replaced it with this imposing stone one. It is not a place most folks would like to visit I suspect. But maybe once you have been inside and came out again and saw all the statues and color you would feel just a little bit better. Over the past number of years they have been installing these folk art pieces. Last summer on a hot July afternoon I saw an enormous man with a great dark beard using a chain saw to create the Scotish piper above. His belly swelled out against a sweaty dark t shirt. He spent hours and hours working on it. He took his time and was not in a rush. I did not see him looking at any plan. He just fired up the saw from time to time and chips would fly. People would watch him for a short while from a distance and then cover their ears and run away. The stars of the Square right now are of course the Christmas Holiday ones. It strikes me as such a wondrous thing that though they do not move they can so often move us. Who knows how many winters they have sat here. How many spirits they have lifted, and perhaps how glad most people are to finally see them go and that Spring might take their place. There is even a manger scene on one side of the square. There are probably by number more elves and Santas and snow men in and about the Square but the nativity is at least not forgotten. I am not sure if this is a shepherd or a wise man now. I believe he held a lamp so perhaps he was a wise shepherd. I took a picture of a camel covered with snow but it didn't come out very well. He also seemed to me to be a little out of place amidst all the cold. After a while the cold began to creep deeper into m e. My feet were getting cold and colder. Fingers were finding it hard to work the camera and I wondered if I could really show what it was like in the Goderich Square on a cold December morning. It was just me and a hesitant sun and lights that still burned in the middle of the day. It occurred to me that at this time of year most folks see these same sites as me, with my snow covered shoes, from their cars as they drive by. They smile and point and children laugh when the decorations are first put up and then it just blends into the great festivity of Christmas. Because it is in the heart of town nobody can miss it and probably most look forward to the color and brightness when so much of the winter is without it. No matter the darkness there is always light.